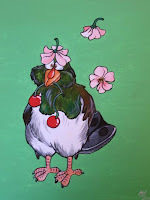 WELCOME TO "THE CHEEKY TUI" a 3 bedroomed holiday home at beautiful Lake Tarawera. Ideal for families, couples or anyone wanting a complete getaway to a quiet & stunning area. A good swimming beach & boat ramp are nearby.There's room to park a boat & plenty of room for children to run around safely.The Cheeky Tui is in a garden setting; its's fully fenced & has many extras.There's a heat pump & a kent fire so is deliciously warm in winter.Make this your base to explore Lake Tarawera & the Rotorua area. 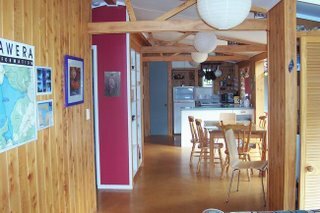 Just 20mins drive from Rotorua The Cheeky Tui is a 3 bedroomed self contained holiday home with a difference. The Cheeky Tui is modern & comfortable, sunny & warm. The kitchen is fully equipped with a dishwasher, microwave oven etc. The dining room opens onto a cobblestoned courtyard with an outdoor eating area with a bbq & brazier. There are 3 bedrooms; one with a queen sized bed, a twin room & one with a set of bunks. Babies are catered for with a highchair & a potacot. Bed linen & towels can be supplied for $15.00 per person per stay. The Cheeky Tui holiday home is great for families. It's fenced & has many extras; climbing frame, swings, bikes, kayaks, videos, DVDs,lego & duplo,board games & atmosphere. There's plenty to do for families & for anyone who wants to be active. Kayaks are available for your use. A 4 day walking track is being established around Lake Tarawera. The first leg from The Buried Village to Hotwater Beach is nearly completed. There are also other existing walks only accessible by boat. We can water taxi you. Pets are welcome inside as long as they are perfectly house trained!